Did I just refer to myself as a blueberry? Case in point...I am slowly losing my mind. I'm officially declaring Mother Nature and myself at odds. It is completely wrong to live in Northwestern Indiana and have to deal with 100° temperatures. WRONG! Perhaps I wouldn't be so adverse to it if it were more sauna-like as opposed to the blanket of water I encounter when sticking one toe out the front door. And I have small toes. Ask anyone. My sisters love to give me a hard time (especially youngest sis aka finger toes). I don't know if it's just the fact that I'm getting old or what, but I've come to despise extreme temperatures in either direction. In all fairness though, I'm 99.99% positive that if some magical person came over and installed an underground pool in my backyard, I'd totally take back the curses I've yelled out thus far. Maybe growing up with a pool (in some form or another...grandparents, our house, neighbors, community pool) tainted my sense of heat perception before now (as in the last 10 years or so). Or maybe it was el niño or la niña or whichever one of those two caused this. I do hate to be a negative nelly, so I'll stop complaining now...but that wish for a pool-fairy stands. ¼ c. (½ stick/2 oz.) unsalted butter, room temp. ¼ c. unsalted butter, room temp. Preheat oven to 375° F. Grease an 8" spring form pan and set aside. Sift together the flours, baking powder and salt. Set aside. Cream the butter with sugar until fluffy. Beat in the egg. Add the flour mixture in three parts, alternating with the buttermilk. Toss the berries with a Tbs. or so flour (this helps to separate the berries and hold them up in the cake) and fold in. Pour batter into the prepared pan. Set aside. Combine ingredients for the streusel with your fingers or a fork until crumbly and pea-sized (just grate as much nutmeg as you'd like...I use ~⅓ of a whole nutmeg). Scatter evenly over batter. Bake for ~45-50 minutes, or until a toothpick inserted in the center comes out clean. Cool on a wire rack. Gently run a thin-bladed knife around edge of pan to help release buckle and remove from pan. **King Arthur Flour sent me a coupon for one free bag of flour. This in no way influenced any of my opinions stated in this post. Ughh, we get dry heat here in California and some days are well over 100 degrees. I still cant complain though as I grew up in Scotland where it's almost 250 days of rain :( I like sunshine and I also like this buckle cake!! sorry about the weather...but this gorgeous buckle should cure any sticky summer blues! Esto es una delicia, que maravilla. I say complain about the heat all you want- it's flippin' hot! I got up the other day and it was already 95 degrees at 9am. It's hot alright but this buckle is hot too! Looks amazing! 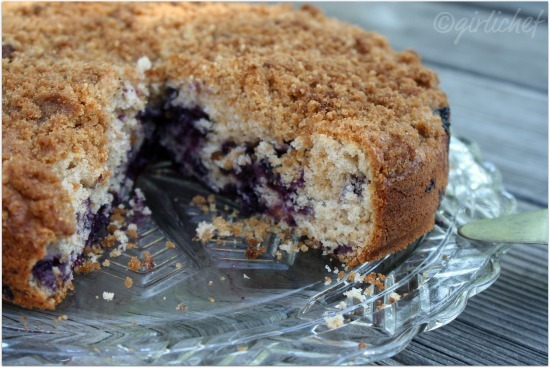 I love the idea of the streusal topping on this. Definitely time for me to go buy some more blueberries. I was wondering about your title as buckle and me are meeting for the first time. I would like to tell him that he looks delicious. And is it okay if I use other berries like strawberries! That is breakfast heaven. Or dessert. It's good for everything! 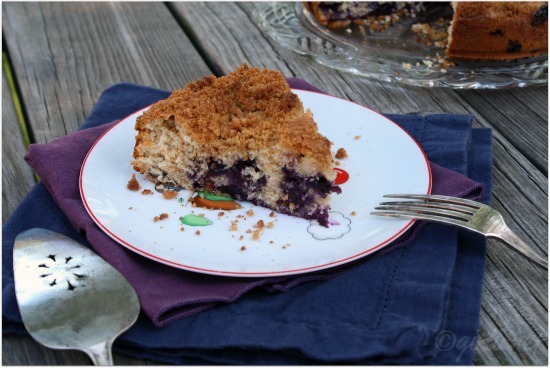 I hava\e this recipe and I am here to tell you it is Fantastic; our blueberries as starting to appear. Like you this heat is sure getting to me. We Never have this in northern Ontario Canada. I love fresh blueberries in cakes, muffins, etc. This buckle looks fantastic! wow 100 degress!! the heat is everywhere.. the ifrst time I made a buckle I didn't toss the berries with flour, lucky me my family never judges..lol thanks for sharing!! I would love if you would come by and link it up to our blog hop since this weeks theme is Berries!!! I always remember eating lots of blueberries this time of year back home in northern Indiana. My brother even worked one summer in high school as a picker near Plymouth, IN. Loved that you used the Whole Spelt Flour, and thanks a Latte' for linking up to my Iron Chef Challenge! I love your blueberry buckle, looks too tempting. Thankfully, California (Southern) hasn't been that horrible in temps till now, very unusual, as usually we are already in 100s here. But, looks like midwest got all the heat this time. Yum!! This looks awesome! Thanks for linking up! thanks so much for linking to Food Friday again, Heather! After a week of 100 degrees F (in Minnesota - the icebox of the nation), I never thought I would be so grateful to see 90 degrees! And we belong to a gym that has a pool - and they drained it this week - for maintenance. So much for pool fairies. Now - the buckle - yes, the buckle! I love the warming look of it with the unbleached flour and spelt. If we ever see 70 degrees again (watch it go down to 30), this will get made. Oh how I YEARN for the 70's! I barely even remember what those were like. These 100's are really killing me. I think I need some of this cake! Oh dear, it looks so heavenly! Gimme some of those blueberry buckles! Even freakier to have 120 heat index in Minnesota. Love the blueberry though! We've been eating a ton of them. I really feel for you in all that hot weather. Don't know if I would survive it. We have nothing but clouds and rain this summer. Crazy weather. Blueberries are one of my favorite summer fruits. Beautiful cake. On the up side, you could be where I am and still be waiting for summer. Still isn't consistently over seventy and rains almost every day... The buckle would be delicious on our cold summer nights. I'm simply melting in this Texas heat myself. Thank you for sharing with me tonight. As always, this looks so delicious. I hope you have a fun and joy-filled weekend. I'm going to be baking and enjoying this Texas heat! Hugs from Austin! It's stinkin' hot. My kids are here from TX and they even say it's hot. I'm not even thinking about baking right now because my air conditioning is broken, but this will be on my list for later, when we finally see those 70 degree days again! I hope you cool down soon! ;-) This buckle looks like the perfect summer dessert. Gorgeous. We have already buckled here in Texas. We are now into our 22 day of over 100 and no rain. It is unbearable. Our pasture grass is straw and we are more everyday. Our lake is so low no one can get their boat out of the dock. 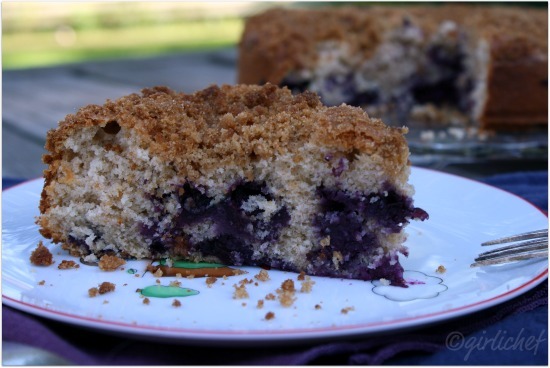 Now your Blueberry Buckle would sure make it better for me, I can almost taste it.It looks so delicious. Thank you so much for sharing with Full Plate Thursday and hope to see you again real soon! Have a great week! I just love new recipes. This is a new one for me. Thank you for the recipe. New follower from Sweets for Saturday. I have been looking for this recipe for some time. Great!